For a Safer New Year, keep that bottle of Champagne Chilled! As you’re counting down to the New Year, keep safety in mind. 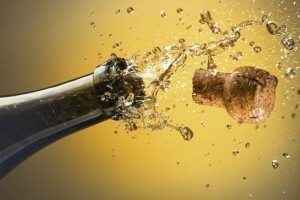 A warm bottle of Champagne (or any sparkling wine) poses a greater risk than a chilled one. According to the New York Times, Champagne bottles “contain more air pressure than that found in a car tire and can launch a cork at 50 miles per hour.” The cork of a warm bottle is more likely to pop strongly because the bubbles expand as the temperature rises, so chill that bubbly to at least 45 degrees Fahrenheit before opening it. While Champagne cork injuries are not common, they can be serious and even cause permanent blindness. Perhaps the most famous victim was Robert Kearns, the inventor of the intermittent windshield wiper. On his wedding night a champagne cork hit his left eye, which eventually became blind. He began experimenting to make windshield wipers that worked the same way as the blinking of his eye, moving at intervals instead of a constant back-and-forth motion. So when opening that bottle, point it at a 45-degree angle away from yourself and everyone else. Hold the cork down while you twist off the wire hood from the bottle. Put a cloth over the entire top of the bottle, then hold the cork and twist the bottle to ease it away the cork. And be sure you keep pointing it away from yourself. Most of the people who are hit directly in the eye by a cork while opening champagne were looking down into it to check their progress. Just keep turning and keep that towel on.